"Cyclops and the Missing Contact Lens Incident: 'By Aquila's Feathers! I had no idea this was the ladies' restroom!'" Pirate girl: Hey what's behind that door? Omg! He has 4 fingers! "Eye Eye" captain... I shall guard this door with my life! 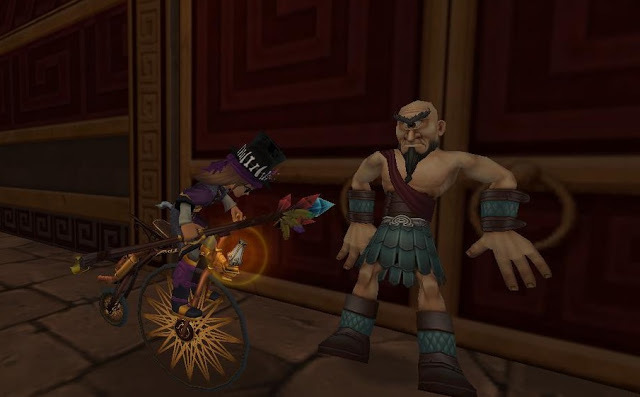 Pirate on Pennyfarthing: Yeah, we'll I'm trying to pop-a-wheely.
" Please don't do it, I have only this one-eye! Your not coming in here riding that pennyfarthing like that.! You'll break everything! Pirate: Do you like my new hat? Cyclops: MY GOODNESS! It's hideous! Get it way from me! This is what happens when you text and drive. "All right, Are you gonna let me in or do I have to pull off a feather and start tickling those knobby knees?" "I don't care how good a rider you are. You're not going out without a helmet on." Congrats to the winners. Very funny, I totally laughed out loud. I am honored to be in honorable mention but I agree with your choices. Truly giggle worthy.